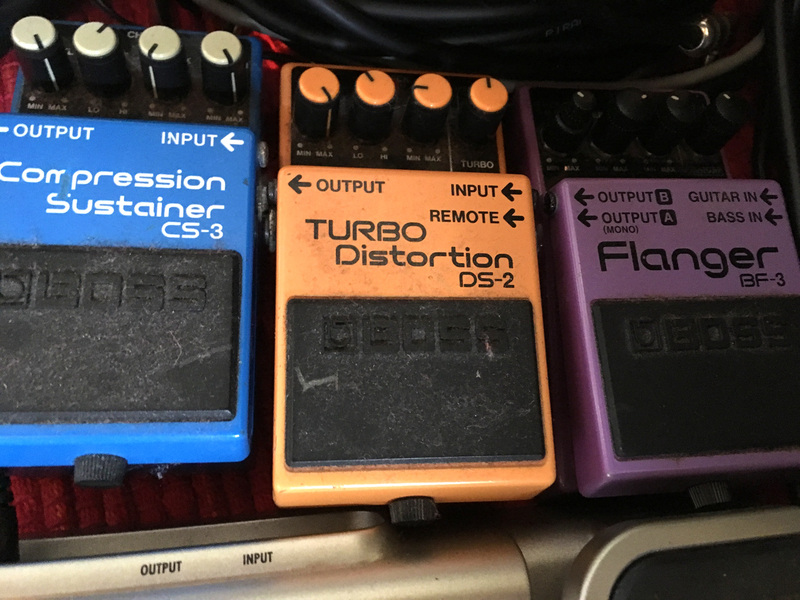 Through the years fans have continually asked me how I achieved certain sounds and effects from my guitar as heard on classic Dayglo Fishermen songs. Now I’m finally going to reveal all! The first ever recording of my guitar work took place in March 1988 (yes that long ago!) 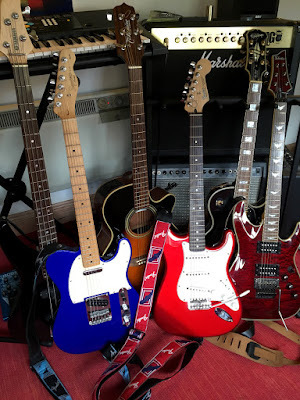 at Peter’s studio on a track called ‘Secrets of Passion’ which employed my first classic guitar set-up of Hohner Stratocaster (the blonde one, below), Carlsbro Hornet 45 watt combo and Pearl chorus and Ibanez analogue delay pedals. It's a very 80’s sounding set-up which can be heard all the way through our first solo album ‘L’Amour de la Vie’, think Andy Summers, The Edge etc. This sound was soon supplemented with an Ibanez flanger pedal which featured heavily on the next couple of ‘solo’ albums with Peter ‘Sensations Without Thoughts’, ‘Love’s a Dangerous Language’ and especially on ‘Curious Comforts of Obsession’ on tracks like ‘Spirit’ and ‘Opium’. In a parallel universe a band called the Dayglo Fishermen was stirring! Enter David (Dave) Fothergill who would use my equipment on the first Dayglo Fishermen album ‘Drenched’ to great effect. There is some nice ambient guitar throughout the album especially on ‘Easy Projector’. Loving the first Dayglo Fishermen album so much, and having worked with Peter over the past few years, I pushed myself into the band! And so began my journey with the Dayglo Fishermen. The first album I worked on was ‘Strange Plaice’ from 1991, which is probably the most fun I have ever had in a recording studio – lots of jokes and cartoons come to mind! But as far as the guitar was concerned I was finding my feet, trying to mesh with the keyboards and add something original to the mix. The sounds were a mix of delay, chorus and flanger with occasional overdriven guitar (through my amplifier), trying to emulate the sounds/styles of Prince, Cocteau Twins, Def Leppard etc. 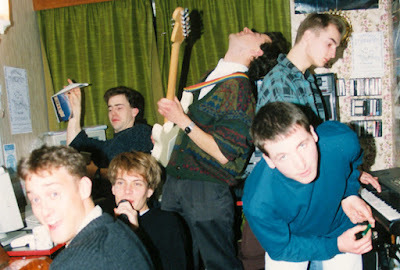 Recording 'Strange Plaice' at Artlite Studios, circa January 1991. I'm in the centre holding my Hohner Stratocaster. Such sessions were cramped, frenetic and fiercely creative. The other band members (left to right) are David Fothergill, Peter Fothergill (back left), Peter Carmichael and Eamonn Maddick. Top right is Richard Carmichael, who was a guest artist on the previous album, 'Drenched', and who just happened to be visiting the studio. This sound was employed for the next few albums – ‘Fresh Gin’, ‘And So It Is’ – but change was on the horizon. Around early 1992 the musical world was waking up to heavier guitar oriented music in the form of Grunge and ‘Achtung Baby’. Not that we could ever emulate this sound, nonetheless we certainly went for a heavier guitar sound which was reflected in our ‘Magic Organ’ album, along with darker lyrics and more metallic keyboards. The main guitar sounds on this album were compressed distortion from guitar effects (various boss effects borrowed from fellow band member Eamonn Maddick) and an over-driven guitar amp along with some delay – please note that there was little chorus or flanger used which was unusual for me at the time – have a listen to ‘Hate’, ‘Silent Scream’ and ‘Burn the Flag’. More change was on the horizon with a major line-up change to the band, or should I say split. To cut a long story short we parted ways with Sean and Eamonn and so it was back to just me and Peter. The resulting album ‘What the Hell’ saw a more refined guitar sound, and so did the following album 'Keep to the Path' – check out ‘Loving the Enemy’ – with a strong use of delay and chorus, but it was with the next album that the guitar stepped up a gear. The ‘The Dayglo Fishermen’ album from 1993 was our most accomplished to-date, incorporating a mix of ambient, dance, prog. and rock influences and this was reflected in the guitar sounds and set-up. 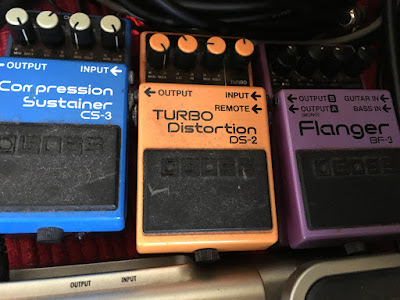 The set-up included a new guitar – a Fender Stratocaster (the Black one in the earlier photo) and new effects - Boss Compressor/Sustainer pedal (see below) and most notably an Ibanez Wah Wah pedal. Songs which showcase the new sounds include ‘For a Day’, ‘Trash’ and ‘Down and Out’. The following albums ‘Animate’ (1993) and ‘Big Spoon’ (1994) featured a similar guitar set-up but more refined. And so ends our Northern Chapter. In the autumn of 1994 the band relocates to the South East of England (London and Buckinghamshire) and we start work on a new album in late 1995 with a brand new member - vocalist Ginny Owens. The 1997 album ‘Space Dog’ features an eclectic range of guitar styles and sounds, which fit the broad pallet of songs. Two songs which stand out from a guitar perspective are ‘Worlds in a Room’ and ‘Space Dog’. 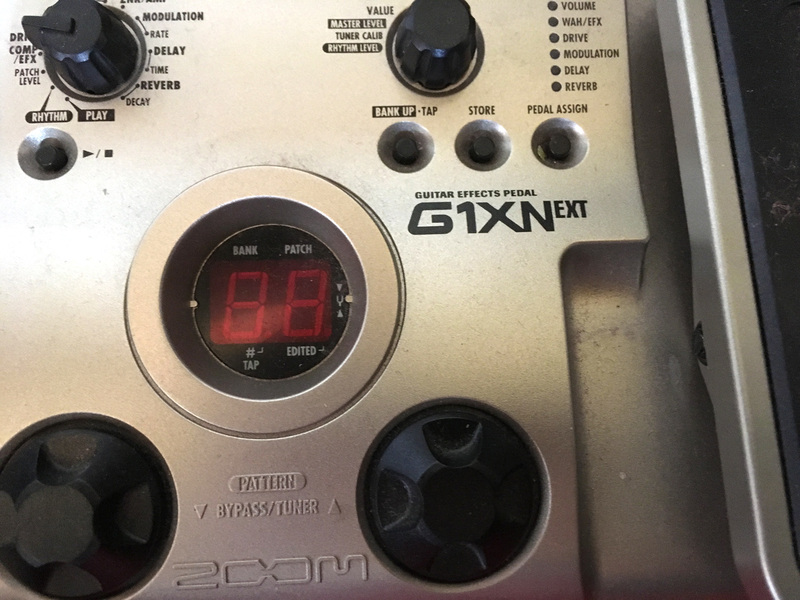 A more complete and assured guitar delivery was achieved on the next album ‘Painting Aliens’ (1998), featuring new sounds from my Fender Deluxe 122 50W amp, Aria Pro multi-effects unit (chorus, delay and EQ) and Boss Turbo Distortion pedal (shown above). A bigger much fuller sound was achieved throughout the album but most notably on tracks like ‘Underground’, ‘Passion’ and ‘Painting Aliens’. 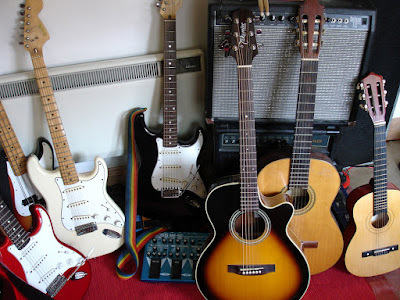 Of note during this period I was influenced by guitarists such Robin Guthrie, The Edge, Johnny Marr, Robert Fripp etc. 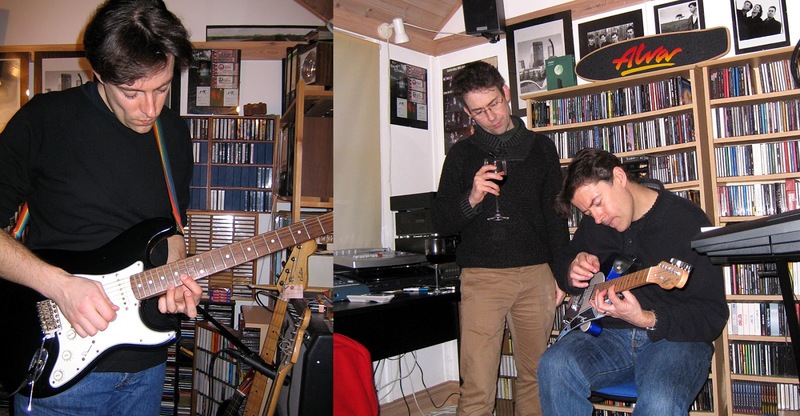 Rare images of me during the recording process - Left: preparing to record for the 'I Can See a Boat ... It No Longer Floats' album in early 2006. Right: working with Peter on the 'Midnight Souls Still Remain' album in 2014. Over the next few albums - ‘Comet Nerdlinger’ (2001), ‘Queen of the Sunset City’ (2003) and ‘I Can See a Boat ... 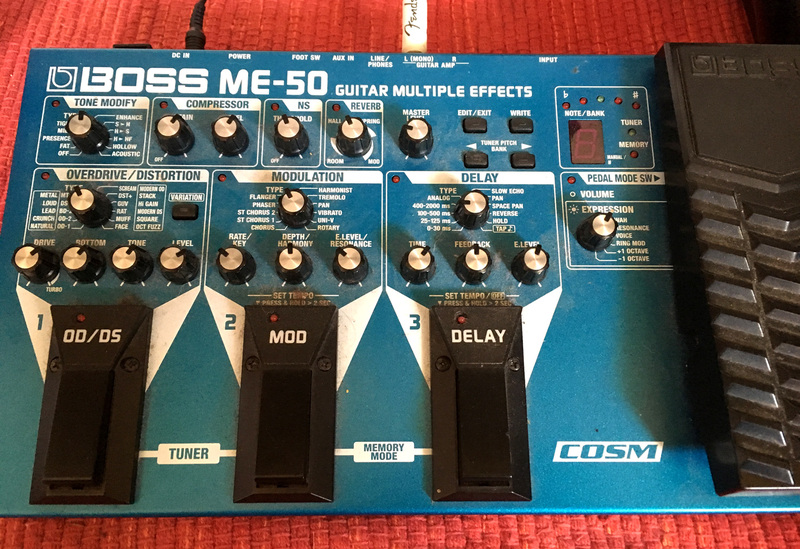 It No Longer Floats’ (2006) - the guitar sounds mature and are supplemented by new guitars - Fender Stratocaster (the red one), Epiphone Les Paul, Takamine acoustic guitar, and my favourite effects unit – the Boss ME-50 multi-effects unit (see below). From a guitar perspective, highlights include ‘Requiem I’, ‘Soncabaret’ and ‘When Summer Ends’. And so to recent times with the release in April 2010 of ‘Moons That Cast Their Light’, and ‘Midnight Souls Still Remain’ in October 2015. Both albums are the pinnacle of the creative path the Dayglo Fishermen have undertaken over the past (nearly) 30 years, with strong creative songs and some of my best playing and sounds to date. All this and Sean coming back to the band, too! Songs ’Never a Shadow (Without a Light)’, ‘Out of the Picture’, ‘Fractured Heart’ and ‘Midnight Souls Still Remain’ encapsulate this new found song writing confidence and creative streak. 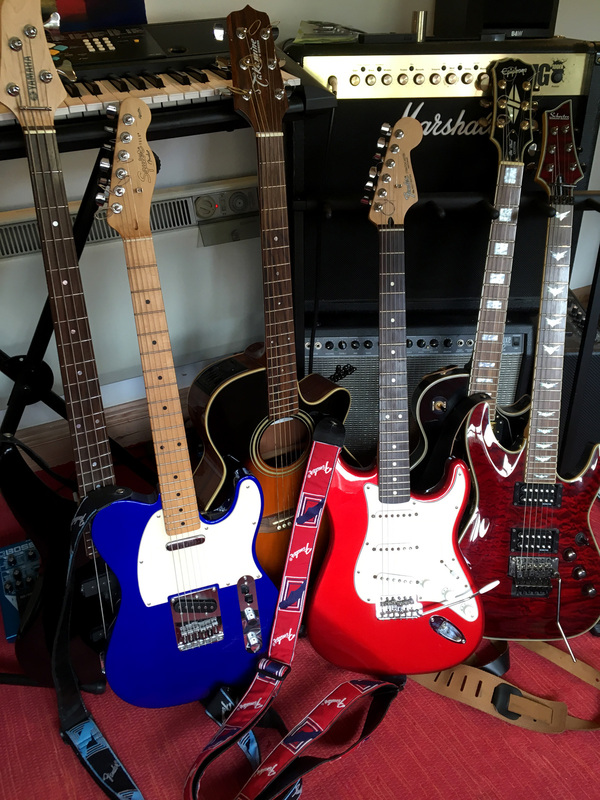 From a soundscape perspective the guitar sound benefited from new equipment including new guitars - Schecter Omen Extreme and Fender Telecaster (the blue one, above), Marshall 100w combo amp (see above) and Zoom G1XN multi-effects unit (below). The story does not end there though. Work is already underway on our next album, which promises to be predominately instrumental and a return to some of the themes of earlier albums such as ‘Big Spoon’. Already there is some interesting guitar laid down on our new state-of-the-art 32 track recording system… so watch this space for more news. In the meantime, happy plucking!